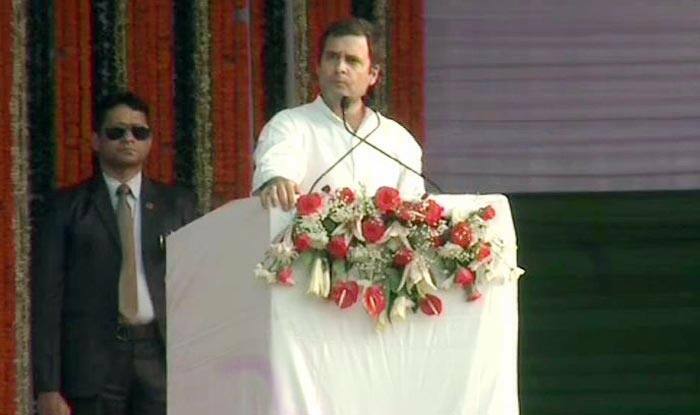 New Delhi: Ahead of 2019 Lok Sabha Elections, Congress president Rahul Gandhi on Monday announced that his party would ensure minimum income guarantee for every poor in the country if it returns to power. “The Congress has decided to take a historic decision that no party has ever taken, The Congress-led government is going to give minimum income guarantee. This means, each poor person in India will have minimum income. This means there will be no hungry, poor people in India,” Gandhi asserted at the ‘Kisaan Abhaar Sammelan’ held in Raipur. The Congress president claimed that no government in the world has ever taken such a decision so far. Furthermore, Gandhi accused the Prime Minister Narendra Modi and the ruling BJP of trying to create two Indias — “one of the Rafale scam, Anil Ambani, Nirav Modi, Vijay Mallya, Mehul Choksi and the other of the poor farmers”. Notably, the event (Kisaan Abhaar Sammelan) was organised to express gratitude to Chhattisgarh’s people, particularly farmers, for voting the party to power in the state after a gap of 15 years. Gandhi also distributed loan waiver certificates to some of the beneficiary farmers during the function. Chhattisgarh Chief Minister Bhupesh Baghel and senior Congress leader P L Punia were among those present at the event.